Well, the weather was just-about-ok, by which I mean it was cold and windy, but hardly rained at all at any time there was music. 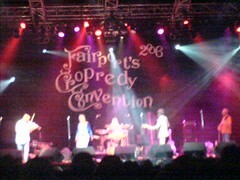 Cropredy's normal music balance of young turks / weird offbeat stuff / old farts seemed heavily weighted towards old farts this year, with Fairport themselves, Steeleye Span, Glenn Tilbrook (of Squeeze), (a band that contained detectable traces of) 10CC, John Martyn, Dave Swarbrick's new band Lazarus, Ashley Hutching's new band Rainbow Chasers, and a Status Quo tribute band. Much of the music was great. As ever, I'd suggest that those who envy all the fab UK summer folk festivals should COME VISIT next year -- though planning well in advance if Cambridge is your target because increasingly, attending the Cambridge Folk Festival requires having a Cambridge-based friend who is prepared to queue for 10 hours. Steeleye -- currently comprising Maddy Prior, Rick Kemp, Peter Knight, Ken Nicol and Liam Genocky -- were just great. I've seen them a few times (3?) since Rick Kemp rejoined the band and I think they're the best I've ever seen them. In particular, they're being careful not to overuse Maddy's voice now, with the result that she can sing some of the harder songs without straining. Musically they're tight, they've got that great back catalogue to plunder, plus Ken Nicol is writing some excellent new songs. And they're still doing new interpretations of folk standards -- eg a new Bonny Black Hare on Thursday.